A medical team from Italy’s University of Modena’s Center for Regenerative Medicine and the burn unit at Ruhr-Universität Bochum successfully transplanted genetically modified stem cells to treat a boy who was suffering from extensive skin damage. People with JEB have a genetic mutation that makes their skin blister easily and makes them more likely to develop cancer. (About 500,000 people worldwide have the condition.) The boy in today’s study developed a bacterial infection that made him lose skin on over two-thirds of his body, leaving him bright red and raw. He was sent to the burn unit at the Germany’s Children’s Hospital at Ruhr University. He was in a lot of pain, and doctors “had a lot of trouble keeping this kid alive,” Tobias Rothoeft, a doctor at the hospital, said in a press briefing. As a final attempt, the doctors contacted Michele de Luca, director of the Center for Regenerative Medicine at the University of Modena and Reggio Emilia in Italy. de Luca had previously done a similar skin graft on legs, but nothing of this scale. 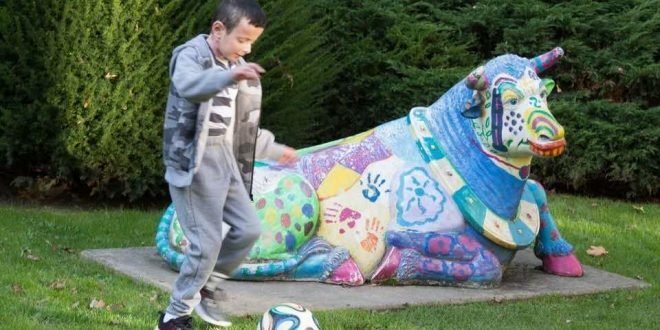 First, his team took skin cells from the boy, including some stem cells, the immature cells that have the ability to develop into many different types of cells and keep growing. Next, they used a harmless virus to deliver a normal version of the gene into the skin cells, so that the genetically engineered cells did not have the mutation anymore. The engineered skin cells and stem cells were then used to grow skin in the lab. The skin was finally grafted back onto the kid’s body. The boy was in the hospital for more than eight months, but now he is healthy. The regenerated skin is good quality, says Rothoeft, and it allows him to do things like normal kids, without the painful blisters he had before. The study shows that just a few long-living stem cells can grow and maintain skin for a long time, de Luca said in the press briefing, which is hopeful for future skin grafts. Now, he is initiating further clinical trials for the therapy.